Competitive lifesaving is a unique mode of aquatic exercise, demanding propulsive actions by the lower limbs wearing fins and one upper limb for the completion of a race [1Abraldes JA, Fernandes RJ, Soares S, Lima AB, Vilas-Boas JP. Assessment of a lifesavers instananeous velocity in mannequin carry using different types of fins. Open Sports Sci J 2010; 3: 19-21. [http://dx.doi.org/10.2174/1875399X01003010019] ]. In this sport, the other upper limb is holding the manikin that a lifesaver must carry during the race, imposing one more constrain to his/her movements. Developing and maintaining a high average speed while keeping low speed variability is critical for the achievement of high performance during swimming and possibly during lifesaving competition [1Abraldes JA, Fernandes RJ, Soares S, Lima AB, Vilas-Boas JP. Assessment of a lifesavers instananeous velocity in mannequin carry using different types of fins. Open Sports Sci J 2010; 3: 19-21. [http://dx.doi.org/10.2174/1875399X01003010019] -4Dekerle J, Sidney M, Hespel JM, Pelayo P. Validity and reliability of critical speed, critical stroke rate, and anaerobic capacity in relation to front crawl swimming performances. Int J Sports Med 2002; 23(2): 93-8. [http://dx.doi.org/10.1055/s-2002-20125] [PMID: 11842355] ]. In this respect, continuous measurement of speed and detailed recording of its variation should be regularly applied for testing competitive lifesavers. Previous studies have used a portable speedometer to record speed variations during sprint swimming [5Barbosa TM, Morais JE, Marques MC, Silva AJ, Marinho DA, Kee YH. Hydrodynamic profile of young swimmers: changes over a competitive season. Scand J Med Sci Sports 2015; 25(2): e184-96. [http://dx.doi.org/10.1111/sms.12281] [PMID: 24975756] , 6Soares S, Fernandes RJ, Machado JL, Maia JA, Daly DJ, Vilas-Boas JP. Fatigue thresholds assessments in 50m all out swimming. Int J Sports Physiol Perform 2014; 11: 11. ], with the same methodology being used to compare speed changes during manikin carry with different kind of fins in competitive lifesavers [7Abraldes JA, Soares S, Lima AB, Fernandes RJ, Vilas-Boas JP. The effect of fin use on the speed of lifesaving rescues. Int J Aquat Res Educ 2007; 1(4): 329-40., 8Abraldes JA, Lima AB, Soares S, Fernandes RJ, Vilas-Boas JP. Mannequin carry effort by lifesavers using different types of fins. Facta Univ Phys Educ Sport 2010; 8(2): 115-24.]. Speed variation and fatigue index calculation are useful tools for comparison between different kinds of fins and provide helpful information for the fitness assessment of lifesavers. Speed variation characteristics can be further analysed, and additional useful information can be obtained, using the advantage offered by the high sampling frequency of data collection when using a speedometer. This would require an elaborated mathematic treatment to get valid results regarding exact time-points of a race when distinct speed variation changes occur. Such information would be useful for the coach, helping in designing a training plan focused in delaying the time when speed drop or speed variation changes occur, aiming increasing the mean speed of the lifesaver. An approach requiring the continuous wavelet analysis of the signal produced by the speedometer has been suggested for application during sprint swimming [9Machado L, Soares S, Vilas-Boas JP. Use of the continuous wavelet transform to characterize the 30s maximal test in swimming 2007. Conference of Numeric Methods in Engineering & XXVIII Iberia Latin-American Conference about Computational Methods in Engineering; Porto, Portugal: Faculty of Engineering. 2007.] and has been effectively used to identify exact time-points when distinct speed variation changes occur in a 50 m swimming race [6Soares S, Fernandes RJ, Machado JL, Maia JA, Daly DJ, Vilas-Boas JP. Fatigue thresholds assessments in 50m all out swimming. Int J Sports Physiol Perform 2014; 11: 11.]. Whether this can be seen during manikin carry in a short duration all-out effort is not known. Such an effort possibly presents different speed variation characteristics compared to those presented in front crawl swimming. Furthermore, different kinds of fins may imply different speed variations and it would be helpful to suggest whether one of these may present superior speed variation characteristics over the other. A cable speedometer [6Soares S, Fernandes RJ, Machado JL, Maia JA, Daly DJ, Vilas-Boas JP. Fatigue thresholds assessments in 50m all out swimming. Int J Sports Physiol Perform 2014; 11: 11., 10Lima AB, Semblino P, Fernandes RJ, et al. A kinematical, imagiological and acoustical biofeedback system for the technical training in breaststroke swimming. In: Alves F, Marques A, Eds. Port J Sport Sci 6, Suppl 1 Porto: Univesity of Porto 2006; 22.] was connected to a central point in the manikin’s chest, allowing the measurement of intracyclic velocity variations over time [v(t)]. A brake engine allows the full system inertia to be insignificant, keeping the cable always stretched. All efforts were video recorded using a SONY Handycam camera (HDR-CX160E) placed on a trolley and moving on the pool side parallel to the swimmers movement. The images synchronization with speed recordings from the speedometer was performed by flashing a LED at the starting signal [6Soares S, Fernandes RJ, Machado JL, Maia JA, Daly DJ, Vilas-Boas JP. Fatigue thresholds assessments in 50m all out swimming. Int J Sports Physiol Perform 2014; 11: 11., 10Lima AB, Semblino P, Fernandes RJ, et al. A kinematical, imagiological and acoustical biofeedback system for the technical training in breaststroke swimming. In: Alves F, Marques A, Eds. Port J Sport Sci 6, Suppl 1 Porto: Univesity of Porto 2006; 22.]. Representative schema of speed variation during a 25m manikin carry race. Each upper limb cycle is representing by different shaded areas. The exact points of speed variation change are representing by the 2nd and 3rd vertical lines (threshold 1 and threshold 2), and the first and last vertical lines represent the starting and ending time-points of data analysis. Where SD is the vmean standard deviation, of horizontal speed is the vmean of the upper limb cycles were the vmax was found and of horizontal speed is the vmean of the upper limb cycles were the vmin was found Fig. (1 ). A MatLab (9.0 version) routine, described in detail elsewhere [9Machado L, Soares S, Vilas-Boas JP. Use of the continuous wavelet transform to characterize the 30s maximal test in swimming 2007. Conference of Numeric Methods in Engineering & XXVIII Iberia Latin-American Conference about Computational Methods in Engineering; Porto, Portugal: Faculty of Engineering. 2007. ], was used to analyse the instantaneous velocity curves including a continuous wavelet analysis of the signal. Through this procedure it was possible to locate the exact time points when spectral content changes occurred, with these points separating regions of the v(t) curve with distinct spectral content properties. After locating these specific time points, the mean speed (Vmean) and the biomechanical parameters stroke rate (SR), stroke length (SL) and stroke index (SI) within each region were compared Fig. (1 ). SR was calculated by the time taken to complete three upper limb cycles using the video recordings. SL was calculated as the quotient of Vmean and SR, and SI was calculated by the product of Vmean and SL. Maximum (vmax), mean (vmean) and minimum (vmin) velocities, and fatigue index (FI), during all-out 25m races using stiff and fiber fins. Time-points of speed variation change occurrence in the v(t) curves obtained during 25m all-out races using stiff and fiber fins. Stroke length (SL), stroke rate (SR), stroke index (SI) and mean speed (Vmean) during 25 m all-out races using stiff and fiber fins. Values were measured before and after the time-point of one speed variation change (1st and 2nd intervals; upper panel) and of two speed variation changes (1st, 2nd, and 3rd intervals; lower panel). The wavelet analysis has previously been applied to detect speed variation changes during a 50 m and 30 s maximum swimming effort [6Soares S, Fernandes RJ, Machado JL, Maia JA, Daly DJ, Vilas-Boas JP. Fatigue thresholds assessments in 50m all out swimming. Int J Sports Physiol Perform 2014; 11: 11., 9Machado L, Soares S, Vilas-Boas JP. Use of the continuous wavelet transform to characterize the 30s maximal test in swimming 2007. Conference of Numeric Methods in Engineering & XXVIII Iberia Latin-American Conference about Computational Methods in Engineering; Porto, Portugal: Faculty of Engineering. 2007. ], being observed one and two time-points of speed variation changes. In the current study, despite the short duration of the 25 m all-out race performed with stiff and fiber fins, the wavelet analysis was effective detecting one time-point and two time-points of speed variation change in nine and five cases, respectively. 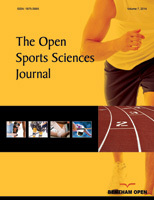 Previous studies using a different mathematical approach for data analysis have detected one time-point of speed change within a 25 m sprint swimming race at 5.5 s after the start [4Dekerle J, Sidney M, Hespel JM, Pelayo P. Validity and reliability of critical speed, critical stroke rate, and anaerobic capacity in relation to front crawl swimming performances. Int J Sports Med 2002; 23(2): 93-8. [http://dx.doi.org/10.1055/s-2002-20125] [PMID: 11842355] ]. This value is close to the current 1st time-point of speed variation change (6-7 s) in cases with two time-points of change. However, the time of one time-point of speed variation change occurrence (~9-10 s) was the double than that that reported in the above-referred study. 10 s is possibly the time required to reach maximum speed (~7 s) plus the time swimmers are able to maintain this speed (i.e. ~2-3 s), as it has been reported after a detailed race analysis with video recordings [11Smolka L, Ochmann B. A novel method of anaerobic performance assessment in swimming. J Strength Cond Res 2013; 27(2): 533-9. [http://dx.doi.org/10.1519/JSC.0b013e31825489b2] [PMID: 22465990] ]. Previous studies that tested the same type of manikin carry using stiff fins indicate a speed drop after 11 s of exercise [8Abraldes JA, Lima AB, Soares S, Fernandes RJ, Vilas-Boas JP. Mannequin carry effort by lifesavers using different types of fins. Facta Univ Phys Educ Sport 2010; 8(2): 115-24.]. Eventual differences between the current data with previous findings is possibly justified by the different training status of the lifesavers compared to competitive swimmers, the use of fins comparing to barefoot swimming and/or to the constraint imposed by manikin carrying. It is plausible that each participant organises his upper and lower limbs movements according to imposed constrains [12Komar J, Chow JY, Chollet D, Seifert L. Neurobiological degeneracy: supporting stability, flexibility and pluripotentiality in complex motor skill. Acta Psychol (Amst) 2015; 154: 26-35. [http://dx.doi.org/10.1016/j.actpsy.2014.11.002] [PMID: 25461440] ], existing evident differences between front crawl swimming and manikin carry one-upper limb swimming with fins, causing unlike speed variations within and between upper-limb cycles. It is interesting to note that Gourgoulis and colaborators observed an increased intracyclic horizontal speed variation when swimming 25 m carrying a load compared to unimpeded front crawl [13Gourgoulis V, Aggeloussis N, Boli A, et al. Inter-arm coordination and intra-cyclic variation of the hip velocity during front crawl resisted swimming. J Sports Med Phys Fitness 2013; 53(6): 612-9. [PMID: 24247185] ]. The manikin carrying, the use of only one upper limb for propulsion and the use of fins are possibly interacting as constrains, causing the differences in the time-point of speed variation changes comparing to the literature. Comparing the two types of fins studied, no differences were observed in vmean, vmax and vmin, as well as FI. In the literature, fiber and stiff fins presented similar instantaneous (2 s) initial speed, but fiber fins showed higher values in the middle of a 25 m all-out manikin carry race [8Abraldes JA, Lima AB, Soares S, Fernandes RJ, Vilas-Boas JP. Mannequin carry effort by lifesavers using different types of fins. Facta Univ Phys Educ Sport 2010; 8(2): 115-24.]. As in this latter study there are some contradictory results - no average speed differences between fins were detected in the first and second half of the race - it is evident the necessity of a more detailed comparison between types of fins. This was accomplished in the current study by implementing the elaborated wavelet analysis, being realised that lifesavers presented a different v(t) profile with each fin type. In fact, some lifesavers presented one time-point of speed variation change with fiber fins but two time-points of speed variation changes with stiff fins and vice-versa. In this case, any time-point difference in the appearance of speed variation change could not be attributed to the lifesavers fatigue and/or fitness characteristics, but to the fin type characteristics, as the same subjects completed the race with both fin types. It is known that different kinds of fins present changes in buoyancy and surface area, implying diverse energy demands [14Zamparo P, Pendergast DR, Termin A, Minetti AE. Economy and efficiency of swimming at the surface with fins of different size and stiffness. Eur J Appl Physiol 2006; 96(4): 459-70. [http://dx.doi.org/10.1007/s00421-005-0075-7] [PMID: 16341874] ]. In addition, although with the wavelet analysis it was possible to detect time-points of speed changes precisely, no difference was observed between fins in the time of appearance of one and two time-points of speed variation change. Interestingly, fiber fins seem to better maintain the speed between intervals (1stvs. 2nd or between 1st 2nd, 3rd intervals) compared to stiff fins. The general biomechanical parameters SR, SL and SI remained (Statistically speaking) unchanged between the 1st and 2nd or between 1st, 2nd and 3rd intervals in all cases, in partial agreement with previous finding in front crawl swimming [6Soares S, Fernandes RJ, Machado JL, Maia JA, Daly DJ, Vilas-Boas JP. Fatigue thresholds assessments in 50m all out swimming. Int J Sports Physiol Perform 2014; 11: 11. ], as observed also for SR during 15 s of a 30 s one-upper limb swimming sprint [15Lee CJ, Sanders RH, Payton CJ. Changes in force production and stroke parameters of trained able-bodied and unilateral arm-amputee female swimmers during a 30 s tethered front-crawl swim. J Sports Sci 2014; 32(18): 1704-11. [http://dx.doi.org/10.1080/02640414.2014.915420] [PMID: 24842469] ]. Although the comparison of biomechanical properties between one-upper limb lifesaving swimming and front crawl is not appropriate, the stability of biomechanical parameters may be attributed to similar reasons, particularly to the appropriate adjustment of upper to lower limbs coordination [12Komar J, Chow JY, Chollet D, Seifert L. Neurobiological degeneracy: supporting stability, flexibility and pluripotentiality in complex motor skill. Acta Psychol (Amst) 2015; 154: 26-35. [http://dx.doi.org/10.1016/j.actpsy.2014.11.002] [PMID: 25461440] ] and according to fin type properties. However, it is likely that during a swimming race >15 s duration it will appear a SR decrease [16Seifert L, Boulesteix L, Carter M, Chollet D. The spatial-temporal and coordinative structures in elite male 100-m front crawl swimmers. Int J Sports Med 2005; 26(4): 286-93. [http://dx.doi.org/10.1055/s-2004-821010] [PMID: 15795813] ].